Grind together coconut, ginger and coriander in the blender, to make a smooth paste. Keep aside. Warm ghee/melted butter. Add the cloves, cinnamon and cardommom. Add the red chilli powder and fry for 30-45 seconds. Now add all the vegetables,including the cauliflower and sprinkle some water on it. Keep covered and cook on a low flame till the vegetables are cooked. This might take approximately 15-20 minutes. 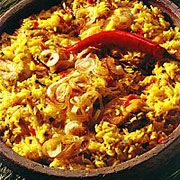 Keep sprinkling water periodically to speeden up the process, but do not add excess water as it will ruin the pulao. When the vegetables are done, transfer the vegeables to a big mixing dish, add all the boiled rice, salt to taste and the blended masala. Mix thoroughly and then heat it either in a microwave or on low heat on the cooking range.It is heated again to let the salt spread across the dish. Serve with Raita.